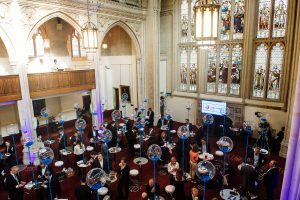 In April 2016 Innovate Finance held their annual global summit focussing on the developments in the world of FinTech at The Guildhall in London. 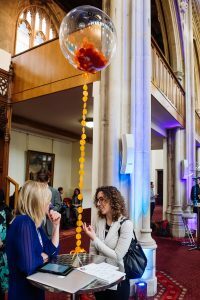 As with many conference events, there was an exhibitor element and Innovate Finance wanted a solution for their exhibitors that embraced the theme of the event utilising innovative technology. This is where we came in! For the second year running Innovate Finance approached Group Dynamics to help them offer an innovative lead retrieval solution. Each of the 1600 delegates that attended the Summit were provided with a RFID Smart Badge on registration and the 100 exhibitors each had a Smart Device with our lead retrieval app installed. When a delegate visited an exhibitor, they scanned their Smart Badge on the exhibitor’s tablet device logging that they had visited that particular stand. The exhibitor could then classify the delegate, write notes about their conversation and optionally send an email to them with information regarding their products and services that was sent immediately. This questionnaire section is able to be fully personalised to the individual exhibitor’s needs and requirements. If a delegate were to return to an exhibitor later, their details and any notes attached to their previous visit would appear to the exhibitor on scanning the delegate’s Smart Badge. After the event, each exhibitor received an email with the details of all the delegates that had visited them during the day as well as any notes they had made in relation to these visits. Are you looking for a lead retrieval solution that provides your exhibitors with more personalised data to help them target new leads as effectively as possible? If so contact us for more information.